A shot of the lower Manhattan skyline of New York City. This time from an angle not seen to often, from inside the city looking out. This photo is available for purchase in the online gallery. The New York City skyline as seen from within. Click on the image to see it larger. 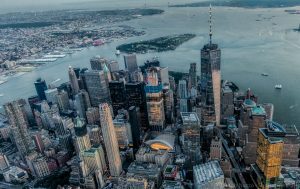 I had a the opportunity yesterday to to take aerial photos of New York City on a doors off helicopter trip with FlyNYon. It was an amazing experience. The staff was super friendly and made me feel right at home from the moment I arrived until the moment I departed. I was greeted by Erika who brought me into the hanger and told me everything I would need to know about the flight. She showed me images of other flights and helped me choose which locations in the city I would like to see during the trip. From there we had a safety briefing and then the staff helped us into our harness that keeps you inside the aircraft while taking pictures. There were four of us on this flight taking pictures. One of them was returning for her 16th flight! Since the doors are off you literally get to lean out of the side of the helicopter while shooting photos. I had two cameras with me during the flight. One body with a Tamron 24-70 lens and the other with the Tamron 15-30mm lens. I found myself using the Tamron 15-30 most of the flight just to try to capture a wider view of the amazing scenes of the city below. The flight lasted 30 minutes but felt like just a few. We took off at 8 PM just as the sun was setting. This made it a bit challenging as the light was changing as we flew. I had to adjust my camera settings to compensate mid flight as the sky darkened. We traveled past The Statue of Liberty, Lower Manhattan, The Brooklyn Bridge, The Empire State Building, Times Square and Central Park. The views were spectacular. 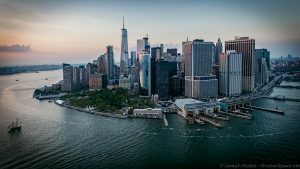 Whether your a photo enthusiast or just want a unique view of New York City, this is an experience you will never forget. Here is the first photo that I have processed from the trip. I took about 450 photos in all so I have plenty of editing work and hopefully amazing photos to work on for the next few weeks. Lower Manhattan – click on the image to see it larger. This past weekend my daughter and I spent the evening wandering around Brooklyn Bridge Park. You couldn’t help but stop what you were doing and watch the last rays of light set behind the New York City skyline. As I have mentioned in other posts, Brooklyn Bridge Park is one of the best locations to take pictures of the NY skyline. When the sun sets behind the city it is not as dramatic a sunset as you would see at the beach. All the red and pink colors are hidden behind the city. You do get a beautiful yellow glow just above the city as the sun drops below the skyline. Our next stop after taking these pictures was the Brooklyn Ice Cream Company and it was the perfect way to end the evening. Check out the image below to see the last rays of light before the sun went down behind the city. Click the image to see it bigger. 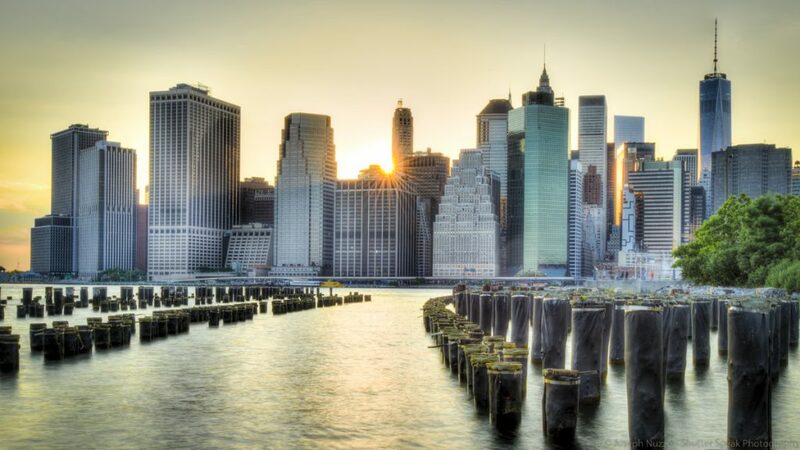 The sun sets behind the New York City Skyline. Click on the image to see it bigger. When I noticed we had a bit of warm weather the other day (short lived) I took a trip out to Brooklyn with camera in hand. The night was perfect. The temperature was a pleasant 58 degrees and photographers were out everywhere you looked. Everyone seemed to be in a super friendly mood. I went with a friend and we stopped and talked with other photographers and took pictures for tourists. The tourists seemed to trust us because we had our cameras on impressive looking tripods… fools! We shot until after midnight and even as we were leaving there were still plenty of photographers out around Brooklyn Bridge Park. 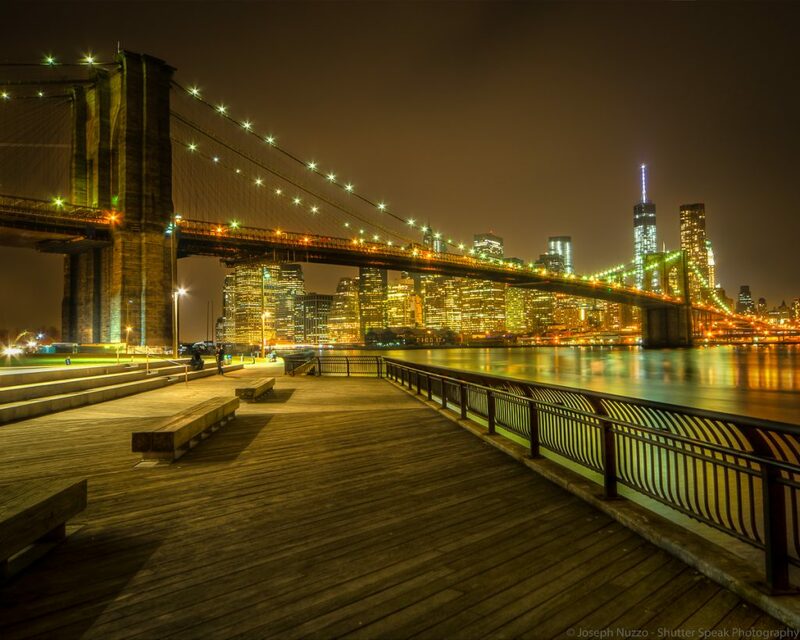 If you’re ever in New York City, Brooklyn Bridge Park offers one of the best views of the city skyline. Be sure to put it on your must see list. Here is one of the shots. Purchase a print of this picture. Here is a shot of the beautiful city of Portland, Maine. Portland is one of those magical places where small town still applies to a city. From the artisan bakeries, to the home made ice cream, to the fresh caught lobsters Portland is just a great place to be (and eat). Art is everywhere you look in Portland which is a city abound by small business still thriving despite the ever looming threat of big box stores. It is also a great place for photographers to visit, boasting the most photographed light house in the nation, The Portland Head Light. Click on the above image to view it full size.